On a minor road off the main street at the southern end of Creetown. The new parish church was built in 1834 at the edge of the developing centre of population. Prior to this the parish church was in the hills behind the nearby village of Carsluith. 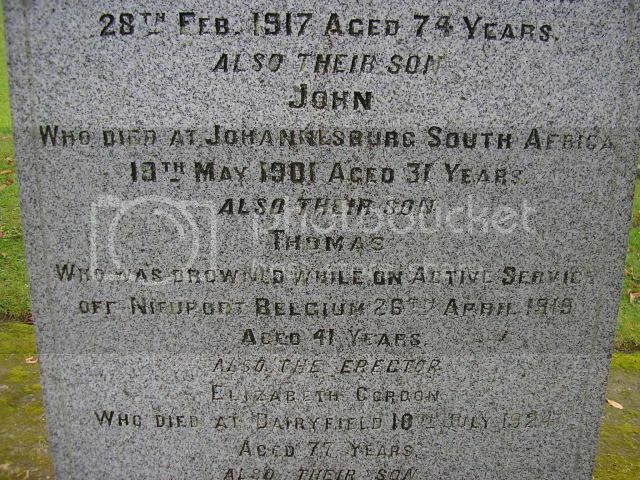 Grave not found - not listed on any local War Memorial. 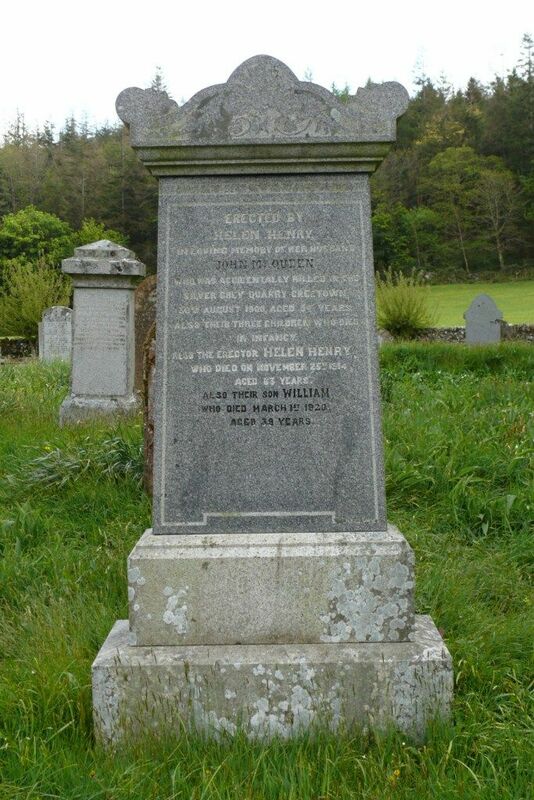 William was born c.1881 the son of John and Helen (Henry) McQueen of Craigielea Cottage, Creetown. 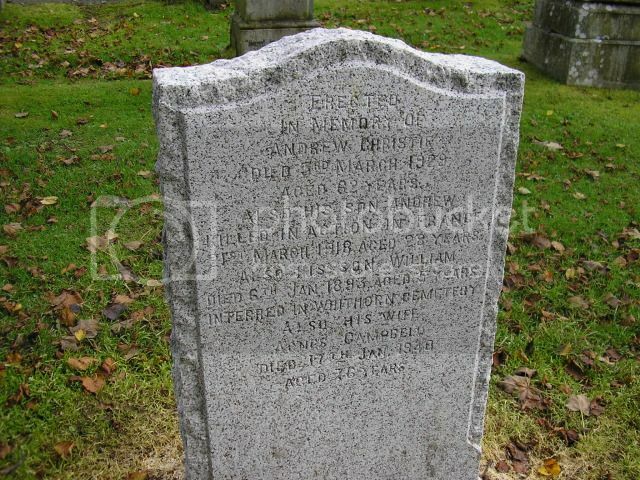 He was the husband of Annie (McMillan) McQueen of Jamieson Street, Govanhill, Glasgow who he married in 1914 in Glasgow. 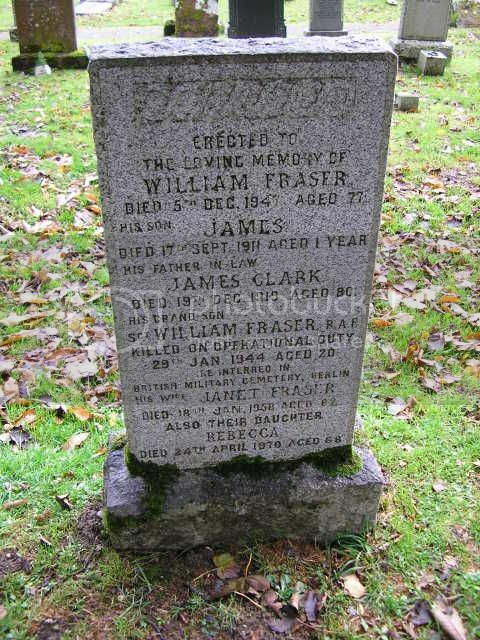 He died of kidney failure in the Victoria Infirmary in Cathcart, Glasgow. 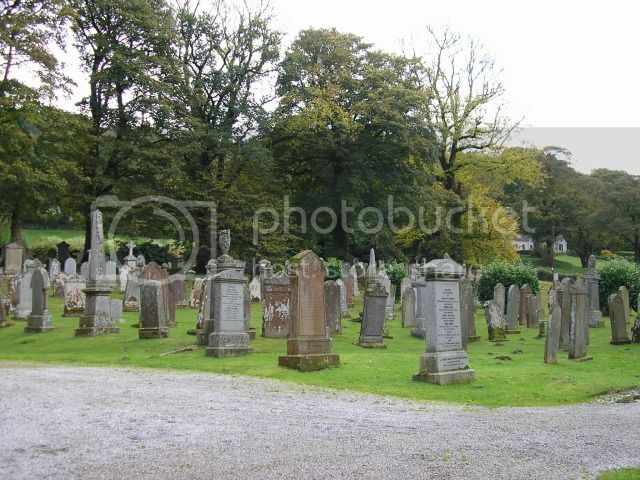 Grave ReferenceEast Extn. Grave 389. 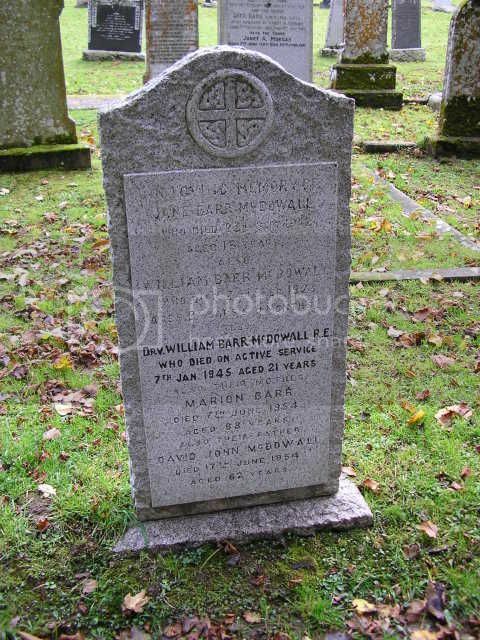 Son of David John and Marion McDowall, of Creetown. 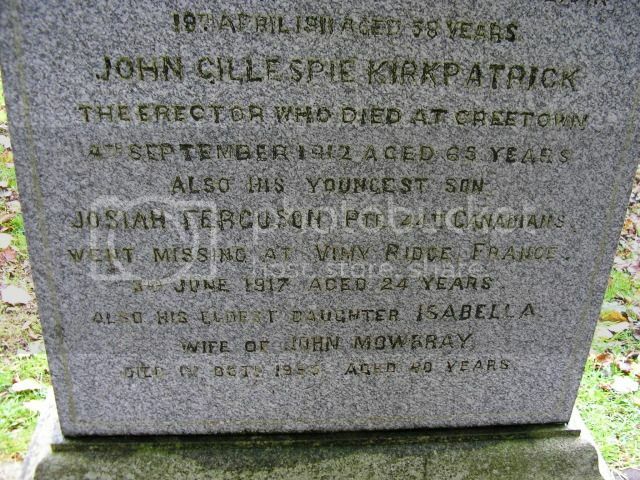 Listed on Kirkmabreck War Memorial. Jane was killed in a car crash just outside Gatehouse-of-Fleet as she and her Fire Guard colleagues were returning from a training exercise. Son of the Rev. 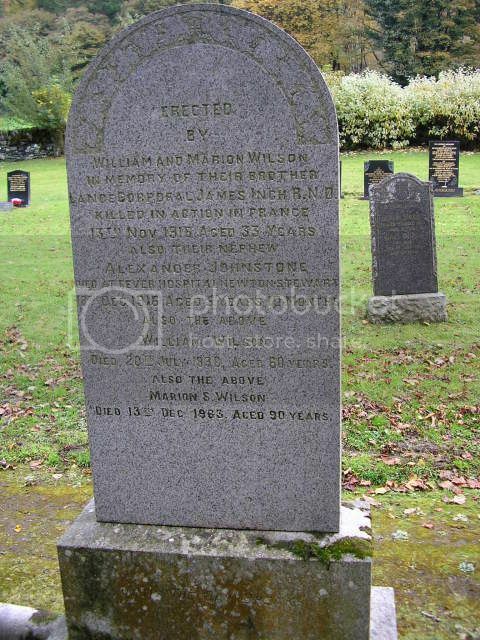 A. Wilson Black and Isabella Black, of The United Free Manse, Creetown, Kirkcudbrightshire. 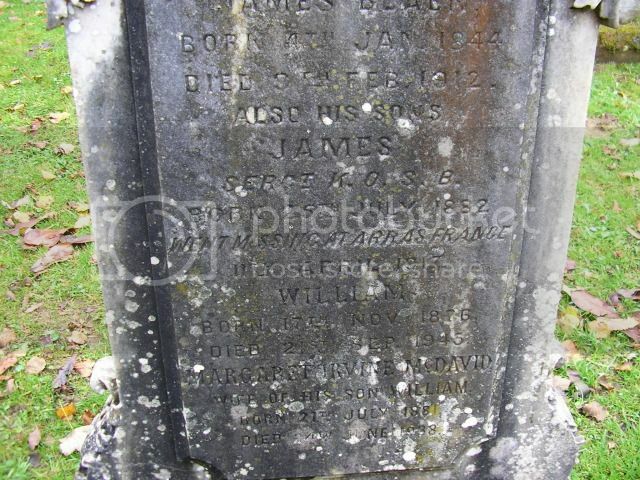 Son of James and Elizabeth Blaen, of St. John St., Creetown, Kirkcudbrightshire. Panel ReferencePanel 1, Column 1. 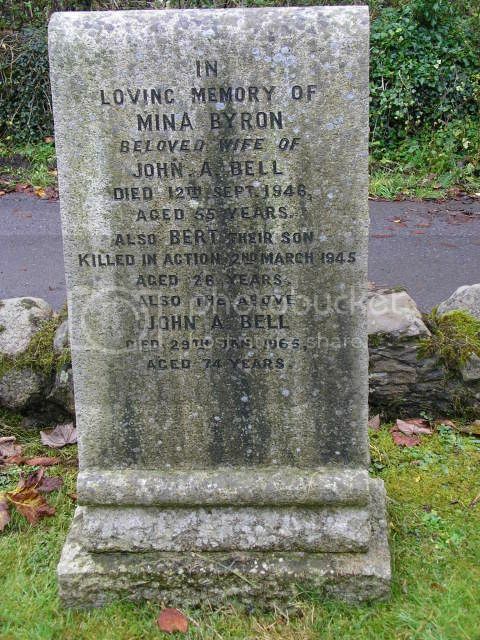 Son of Mr. and Mrs. Nicholas Brown; nephew of Elizabeth V. Irving, of Creetown, Kirkcudbrightshire. 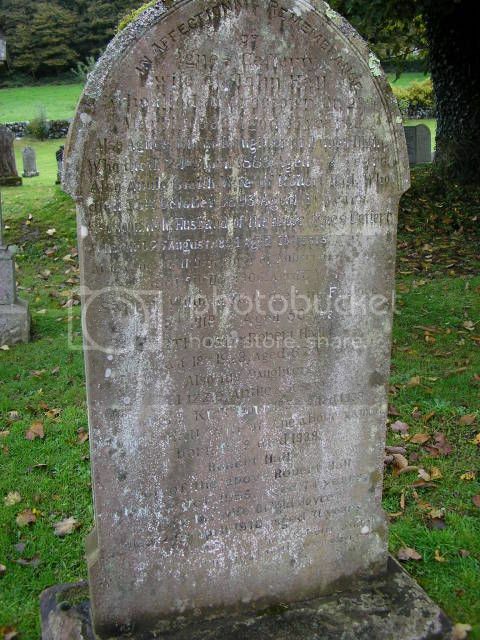 Son of William and Catherine Vernon (Brown) MacGowan, of Newton Stewart, Wigtownshire. Robert was born in 1925 in Creetown. 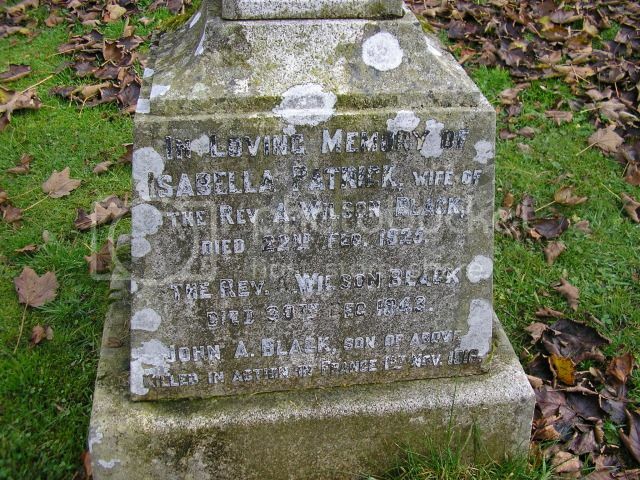 Listed on the Penninghame Parish War Memorial in Newton Stewart. Robert McGowan's Lancaster bomber crashed near Hochfelden, Strasbourg, France. The crew (except for one air gunner who survived) were buried in the American Cemetery at Epinal but were re-interred at Choloy after the war. Son of Mr. and Mrs. Andrew Christie, of Creetown, Kirkcudbrightshire; husband of Agnes, Dalzell Christie, of 87 High St., Irvine, Ayrshire. 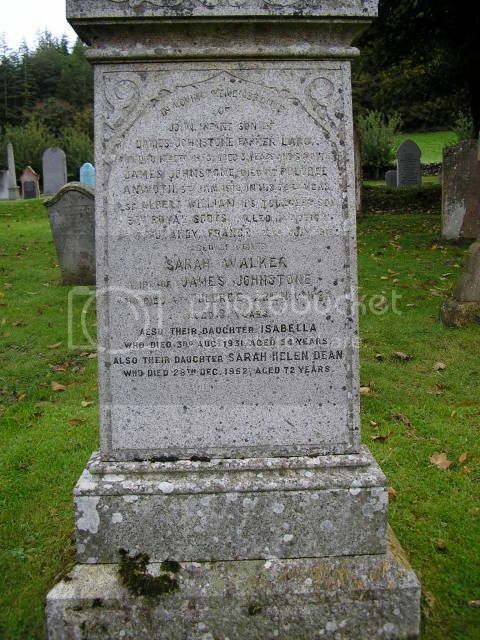 Listed on Kirkmabreck and Irvine War Memorials. 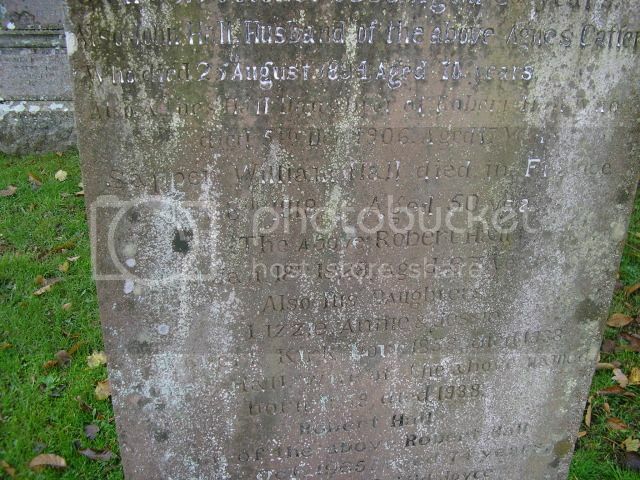 Son of Rebecca Fraser, of Creetown, Kirkcudbrightshire. Gold Medallist, Douglas Ewart High School, 1941. 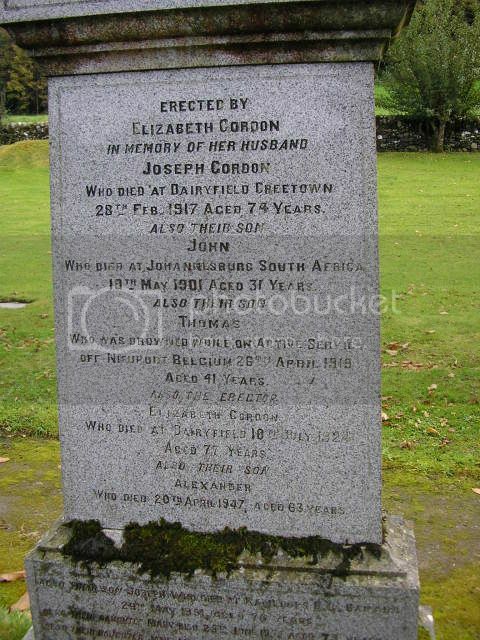 Son of Mr. and Mrs. Joseph Gordon, of Dairyfield, Creetown, Kirkcudbrightshire; husband of Agnes Callander Gordon, of 3, Albert St., Newton Stewart, Wigtownshire. The Royal Fleet Auxiliary Salvage Tug "Hughli" sank off the Belgian coast. Some sources say due to hitting a mine; some due to a storm. 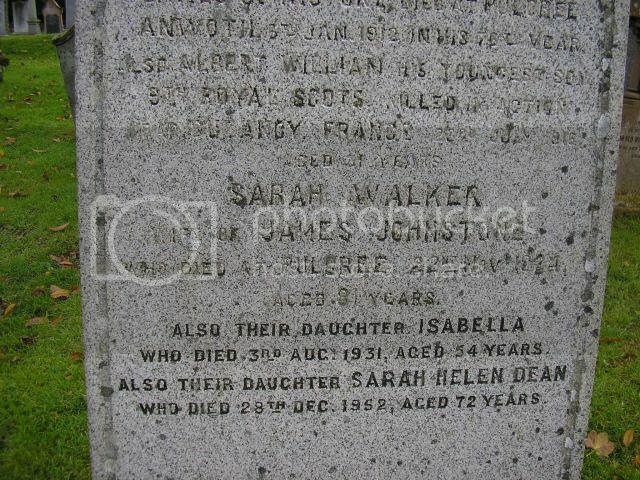 Listed on Kirkmabreck War Memorial as William Hall. of 42 Elgin Crescent. Died at 42 Elgin Crescent. Not listed on any local War Memorial. 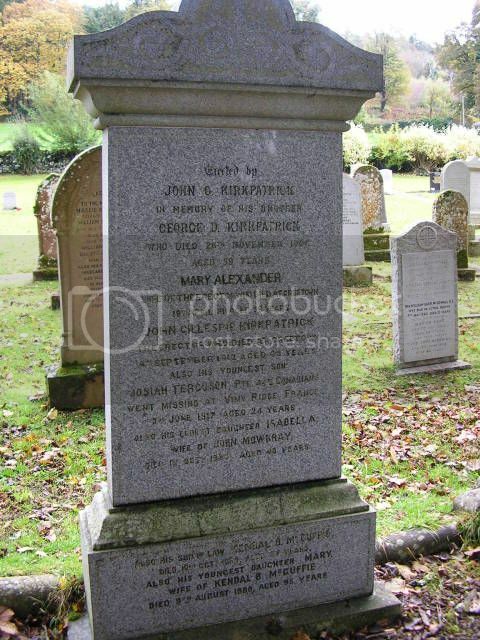 ANDREW “DREW” HYSLOP – age 42 – Civilian War Dead. 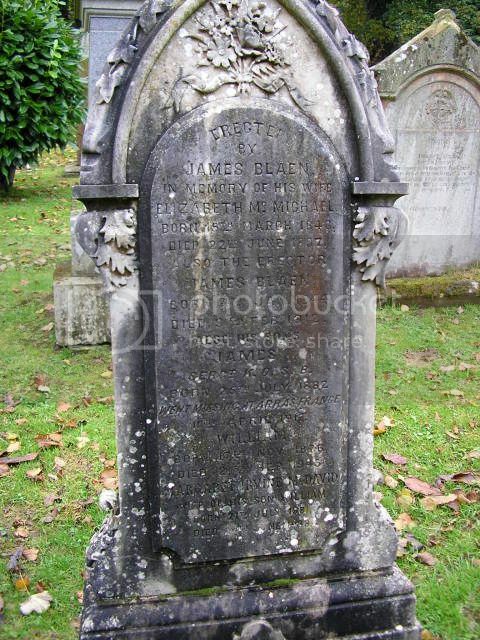 Andrew had been in business in London for some years and was an Air Raid Warden. He was in his lodgings when the house at 42 Elgin Crescent, Kensington, London collapsed during an air raid. Born 1898 in Kirkmabreck. 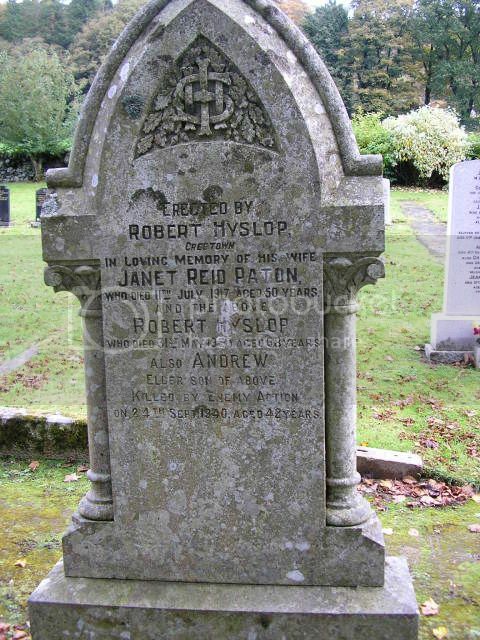 Son of the late Robert and Janet Reid (Paton) Hyslop. 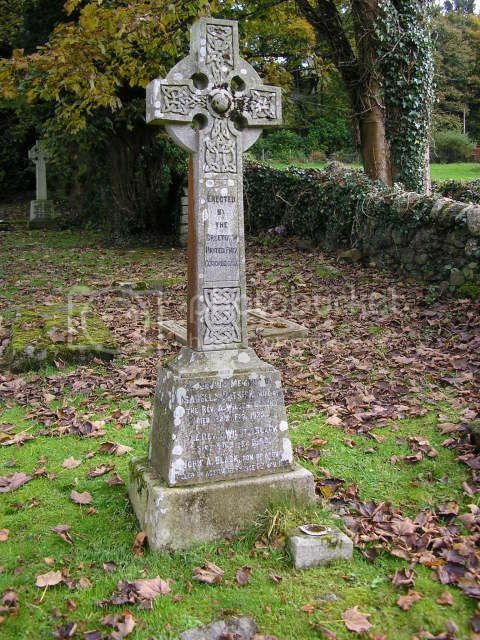 Killed by Enemy Action on 23 September 1940 and buried in Kirkmabreck Parish Churchyard in Creetown. Sergeant Andrew Hyslop, St. John's Street, Creetown. Enlisted January, 1916, l0th Royal Scols Fusiliers. Transferred to 9th Battalion Scottish Rifles. Served on Western Front (Ypres, Soissons). Gassed at Kemmel. (RMR/1366.) 2nd R.M. Bn. R.N. Div. 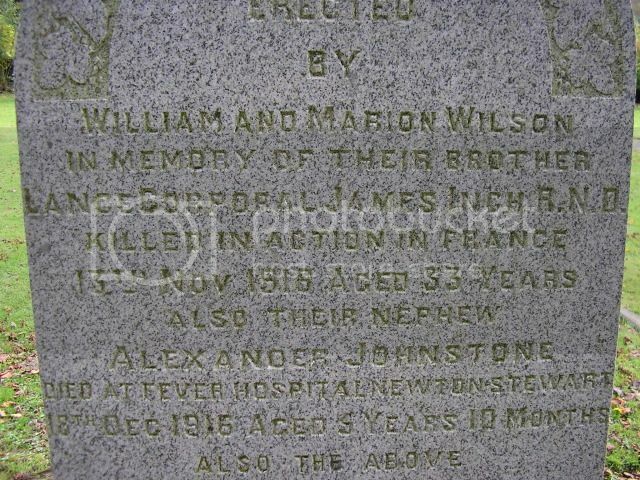 Panel ReferencePier and Face 1 A.
James Inch was born in 1884 in Wishaw, Cambusnethan, Lanarkshire, the son of William and Marion (Connel) Inch and the brother of Marion (Inch) Wilson of Creetown. He enlisted in the Marines in 1901 and served unitil January 1914 when his term expired. He was recalled in August and was wounded at Gallipoli in 1915. He moved with his battalion to France in the summer of 1916. 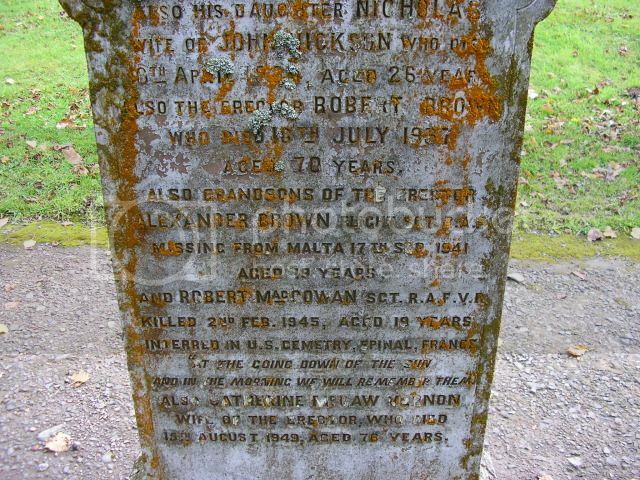 Listed on Anwoth and Girthon War Memorial in Gatehouse-of-Fleet. 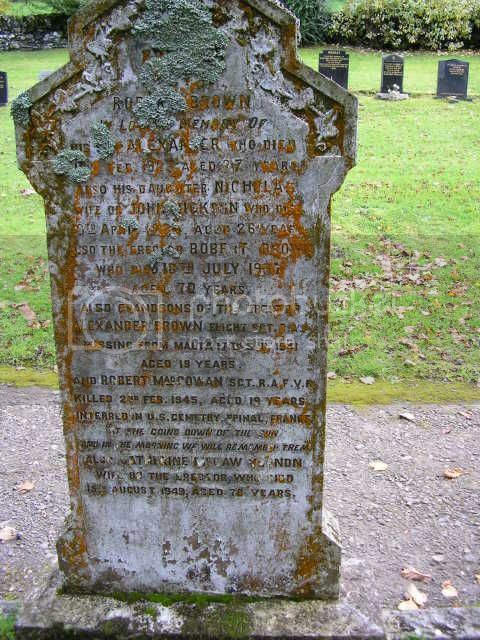 Listed on Kirkmabreck War Memorial as Josiah Ferguson Kirkpatrick.